You are here: Home / Weekly Columns / Opinion / 3 Wedding Blogs Promoting Diversity and Inclusion. 3 Wedding Blogs Promoting Diversity and Inclusion. (ThyBlackMan.com) You’re getting married in a few short months, and you’re pouring over magazines and websites to find everything you need. As you search for the perfect wedding dress, however, one thing is obvious: out of the countless models who appear in bridal ads, no one looks anything like you. At a time when any woman would want to look and feel fabulous, you feel invisible. With so many media sources failing to represent them, women of color are creating their own spaces. Here are three blogs that are bringing visibility to marginalized brides and fighting back against the wedding whitewash. Faced with an industry still perpetuating fairytale images, Reid created Nu Bride to document her reality. Although she initially only intended to document her own wedding planning journey, the blog quickly evolved and is now a three-time Wedding Blog Award winner. Reid recently appeared in a Sky News documentary about Meghan Markle. You walk into a venue only to find the entire staff staring at you as if you just sprouted a second head; they’ve never had a black customer, and you don’t want to be the first. The makeup counter has ten varieties of spray tan and not a single shade of foundation for your complexion. One mention of your hair texture and every stylist in town is running for the hills. Your life would be much easier if you had a list of vendors who had a clue. 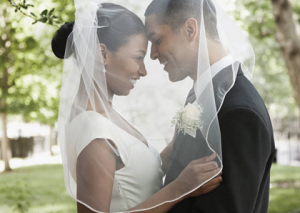 This blog, whose name means “Beautiful Work of God,” is part of a multi-platform, multicultural marketplace that connects engaged couples to the event professionals best qualified to meet their needs. MunaLuchi’s curated group of wedding vendors is called The Coterie. Not only can you search for vendors in your area, but you can also use the site’s personalized matching service. A few lucky readers are chosen to become “Curated Couples,” engaged couples treated to a date night of fine dining and a photo shoot where they sample the wares of wedding vendors. Beyond its role as an intermediary in the wedding industry, MunaLuchi’s mission is to “promote positive images of women of color because we believe positive imagery is the threshold for confidence and confidence inspires self-love.” The blog features both weddings of many styles and brides of many shapes and sizes. While Danielle does create a space for women of color, she puts additional emphasis on couples and the relationships behind the festivities. One of the blog’s popular columns is “One Year Later,” in which couples whose weddings appeared on CBB reflect on their first year of marriage and the lessons they learned. Another, “Brown Girl Tea,” covers issues that can put a strain on relationships, such as unemployment and other money troubles or becoming so focused on planning the wedding that you forget to prepare for the marriage. What other blogs are working to make the wedding industry more inclusive? Tell us in the comments what blogs helped you plan your nuptials.